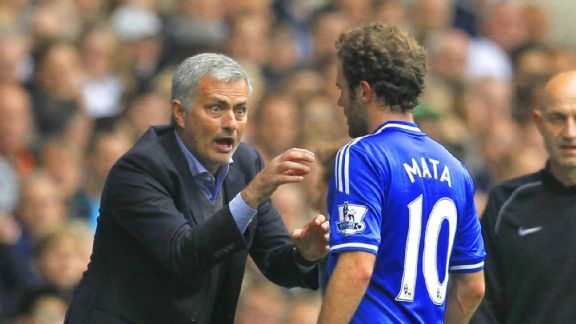 Chelsea boss Jose Mourinho has confirmed that Juan Mata is set to sign for Manchester United having been given permission to meet the club and have a medical. It is the first time anyone from either club has made any comment on the transfer, with ESPN sources on Wednesday revealing that a 37 million-pound deal had been agreed to take Mata to Old Trafford. The deal is now in its final stages and should be completed ahead of United's home game with Cardiff City on Tuesday. Mourinho also revealed the transfer of Mohamed Salah to the club moved very quickly once the "surprise" sale of Mata was agreed, with the Basel player seemingly stolen from under the noses of Liverpool -- just as Willian was in August. In his press conference ahead of Sunday's FA Cup tie against Stoke City, Mourinho said: “Things are really going in a good direction and I think sooner rather than later things will be finalised." Asked why Chelsea had taken such a decision over a player so popular, the manager said it was out of “respect” for him. “I think this club is a special club, it cares with people, and is respectful with the players, especially with the players that wrote the history of the club, and Juan is one of these cases. I think, and I still think, he could be important for us and of course he’s a fantastic player. "In spite of not playing for us, especially in the last period, he could be a very important player for us but Juan had this fantastic opportunity, another big club wants him, in a country where he loves to be and loves to play. "It is an offer that is the right offer for us, so in spite of probably many clubs, many boards and many managers who think you shouldn't sell a top player to a rival club, especially not in the same country you play, we feel and we think differently. "The player deserves respect, deserves to be happy and play where he wants to play, and because the offer is obviously what we consider the right offer for the quality of the player, we allowed him to negotiate with them, and didn’t close the door. “It’s a good offer. I don’t want to say one more million, one less million, it’s a good offer, respectful to us, respectful to the value of the player that allows us to try to bring in another player, because we need another player. "We still have fantastic profit on the investment Chelsea made in the past with Juan, and with the two deals, Juan and Kevin de Bruyne [to Wolfsburg], we have put ourselves in a very good position in relation to financial fair play. “I asked him 'are you really happy to go,' and he was saying 'yes, I am really happy to go,' so after that we have mixed emotions. Here we are all happy, but at the same time we are all sad and I think for him it was a bit the same: very happy to go from Chelsea to Man United, still in England, still in Premier League, probably with guarantees that he’s going to play, and going to be important player for them. On Salah, Mourinho confirmed that he has spoken to the player and been told he wants to come to Chelsea, but the “situation is still open.” Liverpool boss Brendan Rodgers still believes he has a chance of winning the race for the Egyptian. "It was a surprise for us Juan was leaving, we were not prepared to make a bid [for Salah] so everything happened very fast. We tried to work on that and see which could be good options for us. So when we try for Salah, we go from zero. "We didn't even know who the player's agent is. The first step was agreement with Basel... it's subject to a medical."